Gold is moving in lower ranges due to strong USD. The support rests at 1311.99 with resistance at 1319.39 which the weekly pivot point at 1318.63 is located in between the lines. The EMA of 10 is moving with bearish bias in the ascendant channel and it is above the EMA of 200 and the EMA of 100. The RSI is falling towards 50 level, the Stochastic is moving in low ranges and the MACD line is below the signal line in the negative territory. The ADX is showing sell signal. The price is below the Ichimoku Cloud and the Chinkou Span. The Tenkan-sen is showing a downward trend while the Kijun-sen is showing a horizontal trend. The support level breakthrough will smooth the way for further decline towards 1300. While USD is being empowered by the positive economic data, Brexit has no influence on GBPUSD. 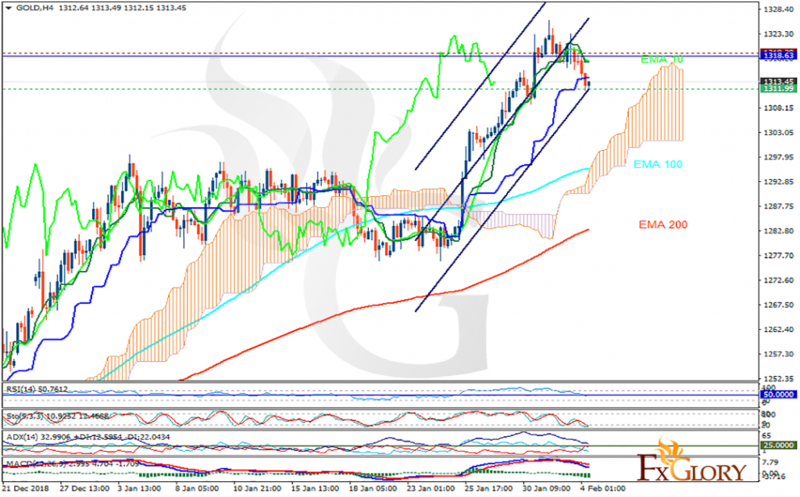 The support rests at 1.30460 with resistance at 1.30950 which both lines are below the weekly pivot point at 1.31130. The EMA of 10 is moving with bearish bias in the ascendant channel and it is above the EMA 100 and the EMA of 200. The RSI is moving on 50 level and the Stochastic is moving in middle ranges. The MACD line is below the signal line in the negative territory. The ADX is not showing any clear signals. 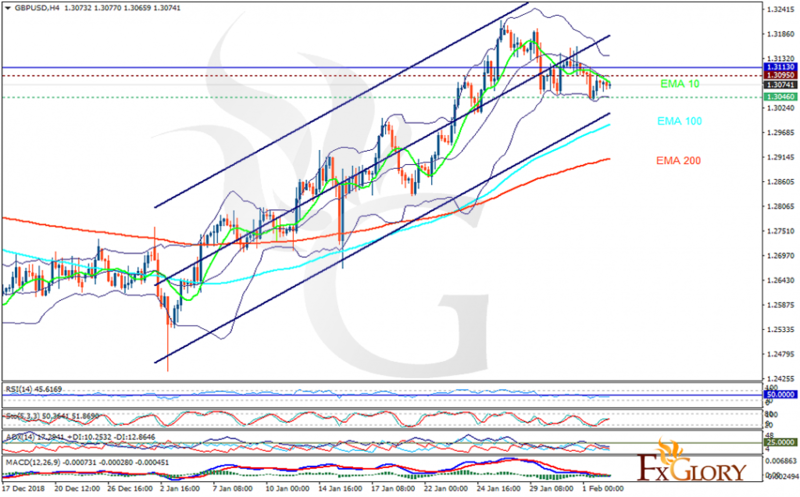 GBPUSD will be fluctuating within the lower and upper Bollinger bands. The support level breakthrough may push the price down towards 1.29 area. ISM manufacturing data and the US Nonfarm Payrolls came stronger than expected and supported USD. The support rests at 1.14280 with resistance at 1.14680 which the weekly pivot point at 1.14530 is located in between the lines. The EMA of 10 is moving with bearish bias in the ascendant channel and it is above the EMA 100 and the EMA of 200. 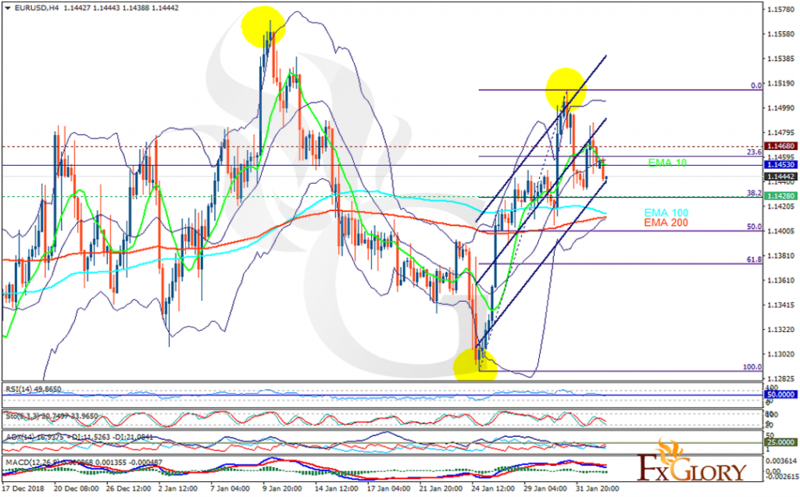 The RSI is moving on the 50 level and the Stochastic is showing downward momentum. The MACD line is below the signal line in the negative territory. The ADX is showing sell signal. The bearish trend may continue targeting 61.8 level of Fibonacci at 1.1370.